Dibrugarh University Recruitment 2019 (April) Assam -Professor,Assistant Professor and Associate professor Posts [27 nos]:- Welcome to North East India's No. 1 Job Portal NeCareer.com . 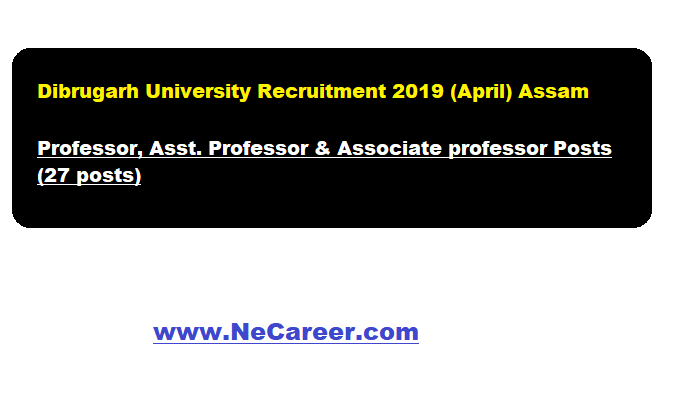 Dibrugarh University (Assam) has published a recruitment notification in April 2019. According to the recruitment, Applications (along with 07 photocopies of the same) in the prescribed form of the University are invited from the intending eligible candidates for the posts of Professor, Assistant Professor and Associate professor in Dibrugarh University. Find more details in below section. Applications (along with 07 photocopies of the same) in the prescribed form of the University should reach the Registrar, Dibrugarh University on or before 26/04/2019 along with a Bank Draft of Rs. 500/- in favour of the Registrar, Dibrugarh University, Dibrugarh payable at Punjab National Bank, Dibrugarh University Branch (Code: 994000). Note : Mere fulfillment of the minimum eligibility shall not entitle an applicant for consideration to be called for interview.